My Mom's birthday is Friday so I needed to make her a birthday card! 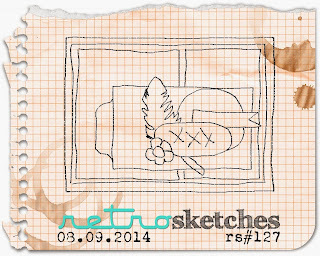 I decided to use Retro Sketches #127 sketch for her card. I loved all of the layer and elements in this sketch! For her card I used the Stampin' Up! Flower Patch photopolymer stamp set and the Flower Flair Framelits Dies. These items are new in the 2014-2015 catalog and I just love them! So easy to use when you want floral images! I used the Flowerpot Designer Series paper for the background images and color scheme. I also used the File Tabs Edgelits Die for the Crushed Curry tab. On the small Tangerine Tango flower I used a rhinestone which I colored with the Daffodil Delight Blendabilities pen. The leaf was stamped using Garden Green ink on Wild Wasabi cardstock. I used some Lost Lagoon satin stitched ribbon behind the Blushing Bride flower. For the greeting I used markers to color in the greeting and used the Project Life Cards and Labels Framelits to die cut it (I love this shape!). I hope she gets the card in time! I made the card this past weekend and will finally put it in the mail tomorrow. Hmmm..